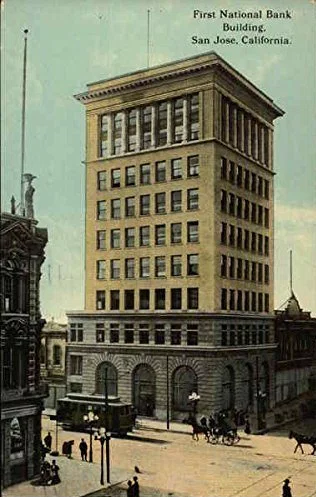 Do you know where the First National Bank Building is in Downtown San Jose? The building below was built in 1910 and still exists today, but looks completely different. To find out what the heck happened, head over to Think Bigger San Jose. We have several historic treasures hiding underneath fake facades unbeknownst to most San Joseans. Well that corner has not had anything worthy to visit for a long time. Also, the businesses surrounding that corner caters to low-income people. Once the rest of Downtown gentrifies we will see higher-end businesses who will pull in higher-class people and that's when we will see that corner becomes less blighted. I remember back in 2006, when Studio 8 was popping and clubbing was hot, that corner was not that bad due to the high traffic of people with money walking around. Downtown needs to become a place to play for all of us and a place to live for wealthy people, only then would Downtown truly be revived. Some may say it's classist, but it's the way it is. This area is so run down and blighted. It's filled with homeless people. Downtown is a tremendous disaster! I can see that you have not been in Downtown for at least a decade :) Time to crawl out under them rocks!